I’ve been here before. This is not my first time taking part in a new boat build. It was 1978, and I was 23 years old when my first husband Jim and I decided that we wanted to build a bigger boat, so we could make a living doing sailing charters. Jim had built boats before, and he had been working at Kehi Drydock in Hawaii just before I met him. He was a professional, so I figured, “How hard can this be?” Ha! We named her SUNRISE, and she was a 55-foot cutter, but it took many, many long hours in the boatyard to get her there. We considered building the hull ourselves, but when we found a company in Costa Mesa, California building a Bruce Roberts design that suited us, we put our money down. We rented their mold and had their crew lay up the hull to our specs. We wanted solid fiberglass, not a cored hull, and we paid extra money to leave it in the mold to cure for 30 days. I remember the day the boat mover truck arrived at the DIY boat yard in Ventura, California. We arrived at first light, and there was the truck driver asleep in the cab. When he climbed out, I was standing there, gazing up at the boat admiringly. I can’t begin to explain how different that experience was from what Wayne and I are doing with Mobius today. In those days there was no such thing as CNC machinery, and everything in the boat was cut to fit. We did everything ourselves, and there was no lovely boat shed to protect us from the sun and the rain. We had no yacht designer to get us from that huge bare hull to a completed boat. We designed our own deck, cabin structure and interior. The price of lead was high at the time, so we bought scrap steel rods from the companies doing off-shore oil drilling, cut it into 3-foot lengths and stood them end in the keel–ten thousand pounds of them–then poured resin in to lock them in place. 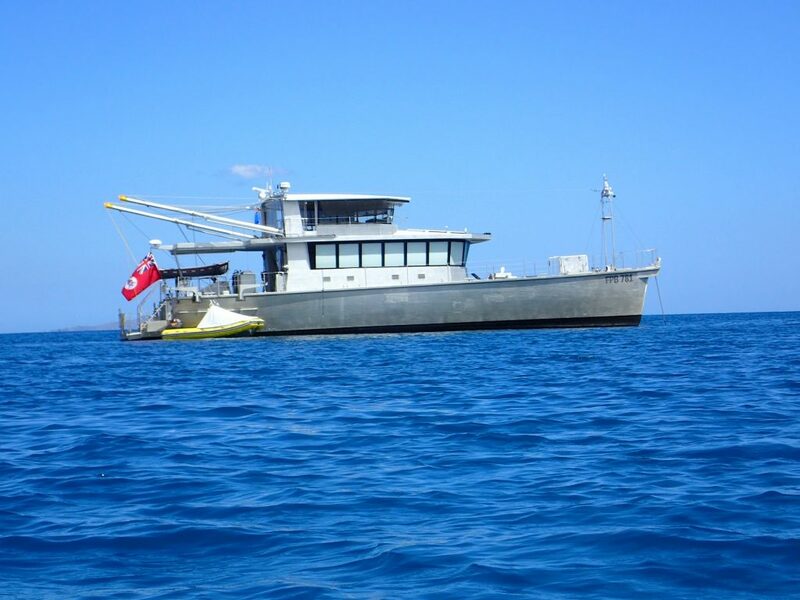 We built integral tanks, fabricated the mast step, and laminated the deck beams. I worked as a waitress the whole time, but nearly every day of those three long years, I went to the yard and worked before or after my shift. I fiberglassed in bulkheads, sanded and filled surfaces for the overhead and the shower stalls, and I held the other end of the wood as Jim worked his magic on it. We did the interior in solid black walnut and cherry wood, no veneer, and I must have made tens of thousands of plugs, including for the teak on the decks. SUNRISE was a special boat. Jim was a master woodworker, and he did all the inlay and carvings, while I did all the finish work and the stained glass. Most anyone who ever saw the boat, remembered her. 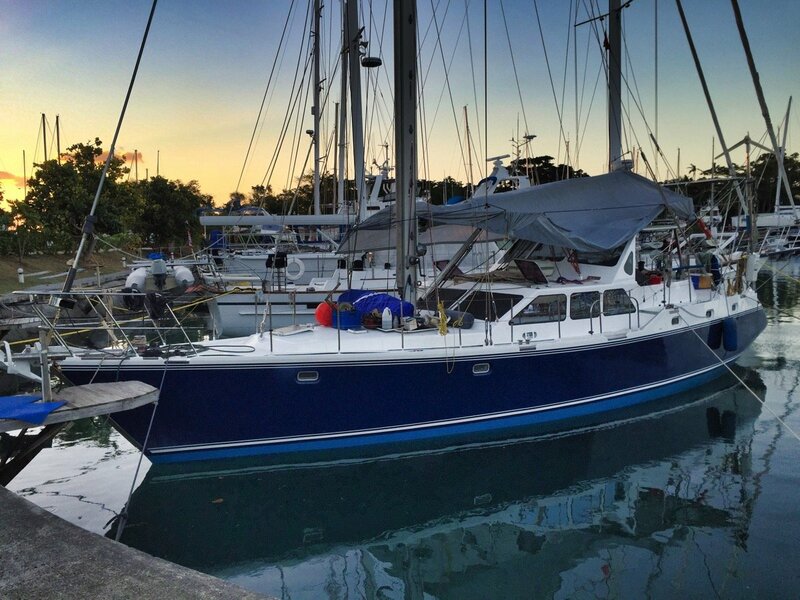 We sailed her from California through Panama to the Caribbean, up to Florida and back to the Caribbean a few times. 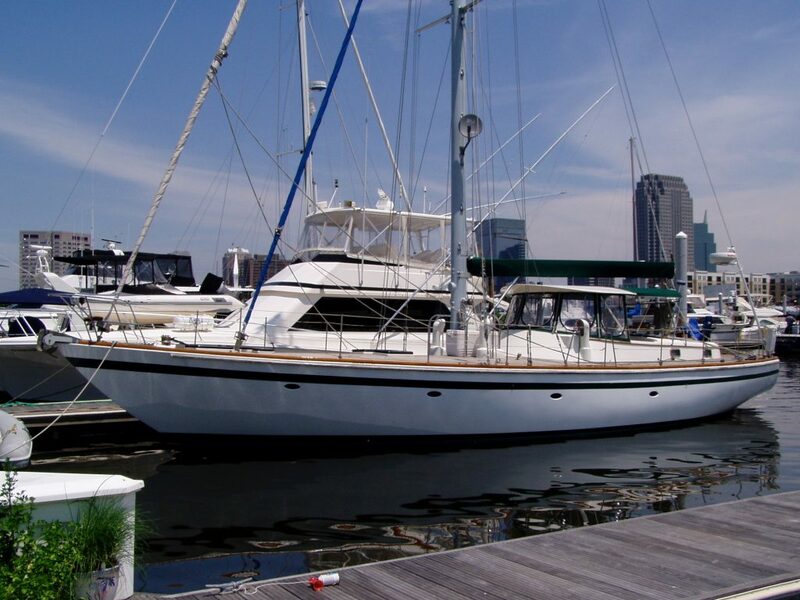 By the time we sold her in 1996, we had owned and sailed SUNRISE for 15 years, and raised our son, Tim on board until the day we sold her and got divorced. Sadly, Jim died a couple of years later. 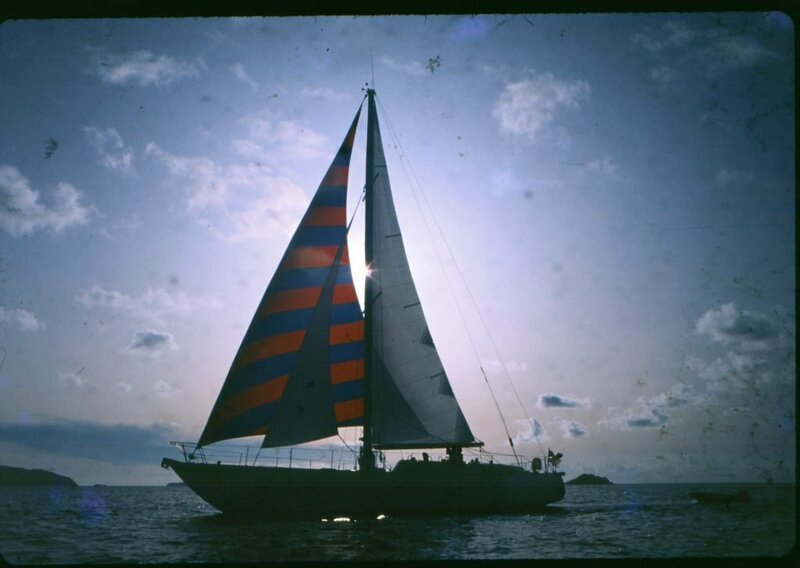 Recently, I dug up lots of old photos, some of them very damaged after years of storage on board boats, and I made this little slide show about those years we built SUNRISE. That comment got me thinking. I wondered if SUNRISE could still be afloat today, 38 years later. What if her current owner would like to see that video and know more about her construction and her story? So, I went to the US Coast Guard Documentation database and looked up SUNRISE. Now, there are 90 some vessels in that database named SUNRISE, but only one of them is 55 feet long and was launched in 1981. It’s got to be the same boat. So, I have decided to see if I can use Facebook and the Internet to track him down and get photos to see what she looks like today. Here goes. I am trying to locate the boat owner by the name of Jonathan Wright and the boat’s hailing port is Fairhaven, Massachusetts. And below here is the most recent photo I have. It’s one that a previous owner sent me about 15 years ago. 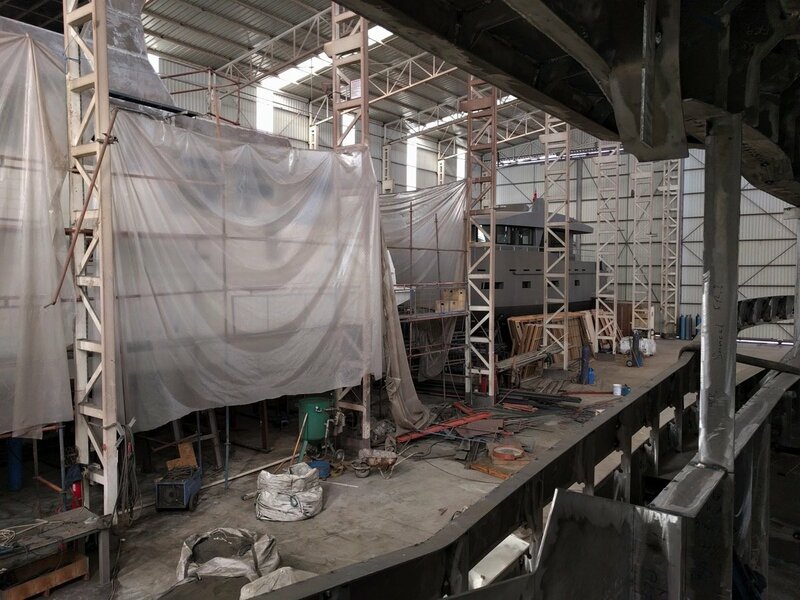 He added the hardtop and bimini and some big davits on the stern. If any of you have seen this boat or if you know of anyone who has, please send me an email at wayne.christine@mobius.world. When we were going through the process of choosing a boat builder, we knew that the location mattered a great deal to us. We didn’t know for sure how long it would take to build the boat, but we knew we would be measuring the time in years, not months, so it had to be someplace we would enjoy. That played a big part in why we chose Turkey. When we first announced we were moving here, lots of people ask us if we weren’t worried for our safety, or were concerned about the standard of living over here. So many people don’t know what a gem this country is. The archeological sites are extraordinary, the nature is stunning, and it’s a modern, well-developed and tolerant country. Even more so, lately, lots of folks have written asking if the political and economic situation is impacting us. I hope that by sharing in this post a little of what our day to day lives are like here, our friends, family, and followers will understand better why (aside from the great boatyard at Naval) we like it so much here. In February 2018, we signed a year’s lease to rent a three bedroom, two bath,1900 sq. ft. fully furnished apartment, and after more than 6 months of living in the place, it has become home. We are on the 9th floor of a 12-story building, and there are only two apartments on each floor. 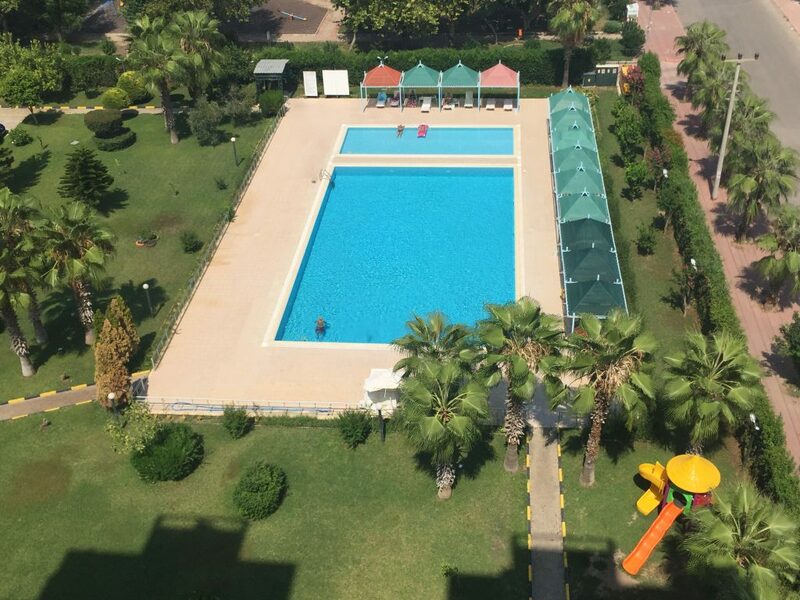 The three buildings in our complex are arranged around the enormous swimming pool and a small playground you see in the photo above. There is 24-hour security on the gate supplied by three very kind gentlemen who smile indulgently at our attempts to greet them in Turkish. 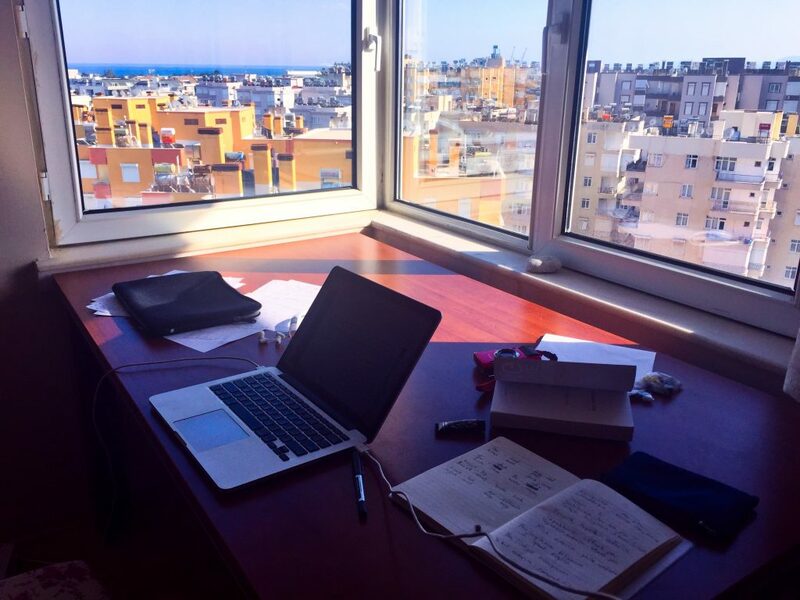 One of the three bedrooms is set-up as my office and out the corner window, I can see a small strip of the blue sea over the rooftops in one direction and the imposing granite mountains in the other. For this, if we count rent, maintenance fees and utilities, we are still under $500 a month. 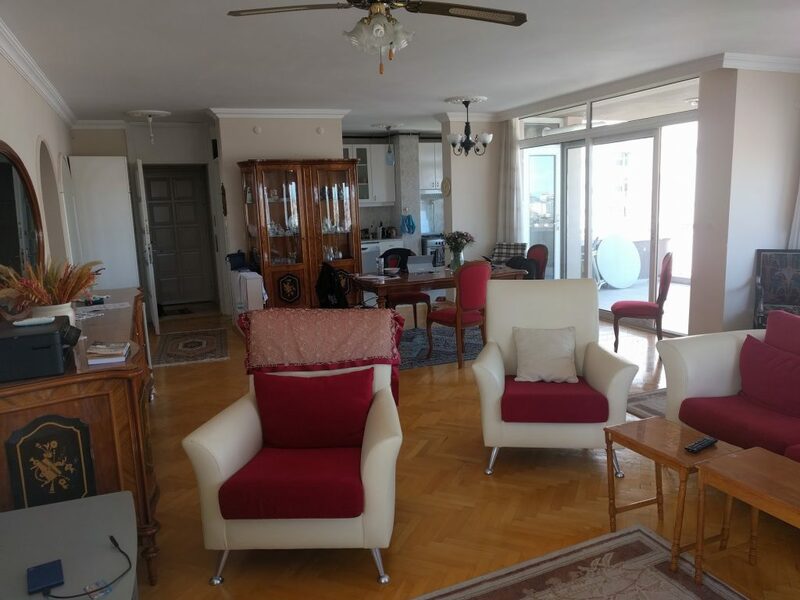 Our apartment is located about six blocks from a long gorgeous beach that was nearly empty in the winter, but is now covered with tourists from elsewhere in Turkey, and primarily from Eastern Europe. It’s not unusual here to find restaurants with tourist menus in English and Russian. The Free Zone where Naval Yachts is located is a kilometer or two from the apartment, and for the last month or longer, Wayne has been riding his bike there every day. I stay at the apartment where I get to work on my book business. I’m drafting a new novel and running advertising for the existing books. I take the dogs out, go shopping and visit the pool. And every day, I try to spend at least one hour studying Turkish. It’s a tough language, but I am determined. I’ve got apps on all my devices and I listen to vocabulary as I walk the dogs, cook and do dishes, and I practice with Duo Lingo, Babbel, Monday and Memrise. The language is unlike any I’ve learned before and Wayne teases me about my fascination with the grammar and structure of the language, but I will be able to speak by Christmas. Maybe. 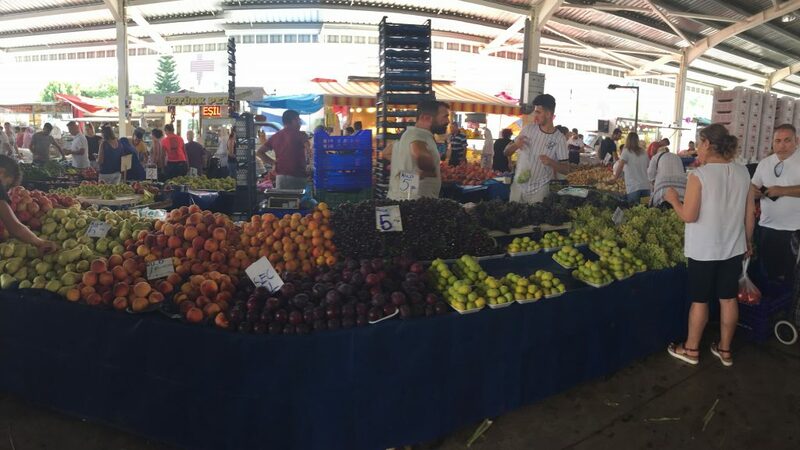 Every Tuesday, there is a neighborhood market selling fresh fruits and vegetables, cheese, eggs, fish, olives, dried fruits and nuts, and various household goods. I take my little rolling trolly just like the other Turkish housewives and walk the few block to fill my shopping cart with all the healthy makings of our Mediterranean diet. The market spills out of the main structure and for two blocks on every side street, people are selling honey or homemade yogurt or bath towels and T-shirts out of the trunks of their cars. We eat what’s in season, so we were enjoying the winter squash and Brussel sprouts back in March, and now it is all about peaches, cherries, grapes, melons, and figs. There are so many different types of peppers, I can’t keep track, but surprisingly few of them are very hot. And tomatoes, a staple of Turkish cuisine, come in every size, color and shape. I look forward to my Tuesday market days as the place is crowded and loud and wild, but loads of fun. The men are always shouting and joking, the Turkish ladies are squeezing the produce with a skeptical look, and the tourists are wandering around showing the whites of their eyes. The fish vendor is also the waiter at our neighborhood restaurant and the young man at one of the olive booths always practices his English with me. The prices you will see in the photos of the market are in Turkish Lira per kilo, and today the TL trades at about six to the USD. It’s hard to beat a kilo of fresh cherries for about 85 cents. Because there is so much good inexpensive food here, we eat very little processed food. I have even taken to making my own granola cereal. 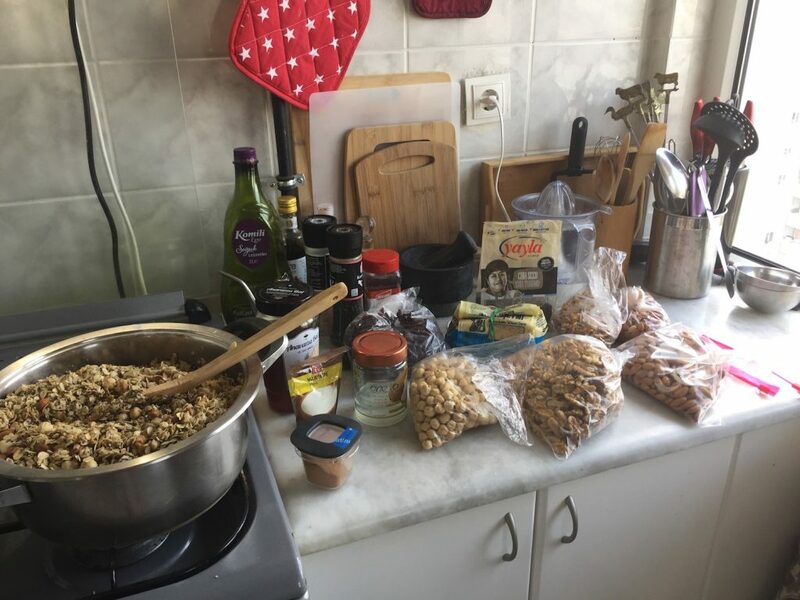 I use oats, coconut oil, Turkish honey, and walnuts, hazel nuts, almonds, chia, dried cranberries and whatever else I can find at the market. Bake it in the oven to crisp it up and with sliced peaches on top, it’s yummy. 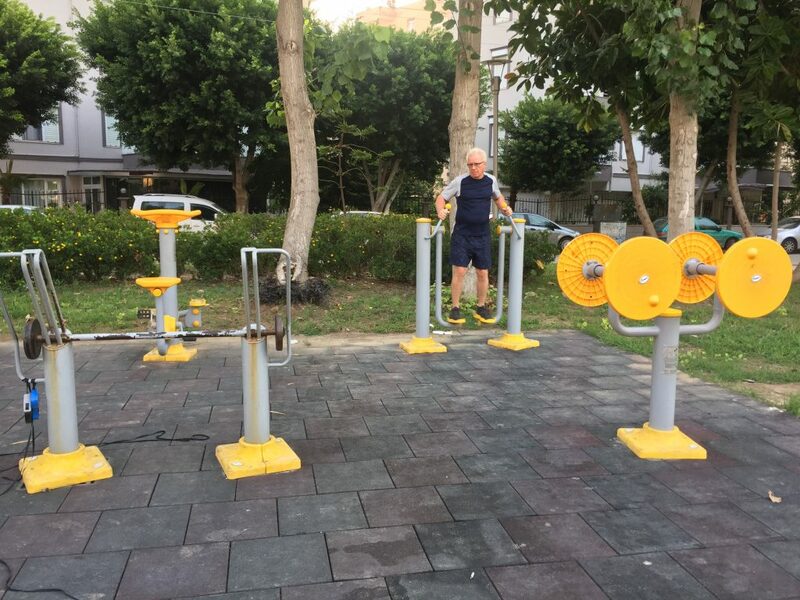 All over Antalya, there are loads of small neighborhood parks, and most of them have playgrounds for the kids and exercise equipment for the adults. With all the good Turkish food here, and no longer living a boating lifestyle, we found our waistlines growing. Back in May, we decided we had to do something about it. We don’t see too many people using the equipment, but for the last three months, we have been getting up at 6:00 a.m. and spending about 60 minutes working out. We take the dogs for their morning walk around the block and we stop at the park for our workout. I had been noticing so much loss of strength in the last few years, and I didn’t think I would ever get it back. Surprise! I’m feeling stronger and healthier than ever. Since we are going to be living here for a long time, we haven’t been in a rush to see all the sites, but in six months we have managed to get out and about a bit. 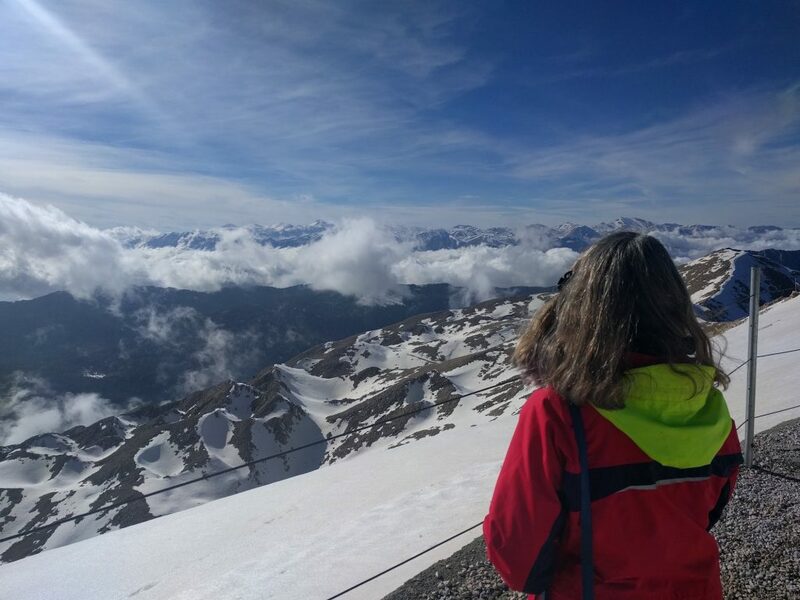 In March, for my birthday, Wayne took me to the top of Mount Olympus Teleferik(Tahtali mountain) via the cable car. The temperature outside the car as we drove the seaside road past Kemer was in the 70’s. We drove up through a fragrant forest to the cable car base, and after a long ride in the cable car, we found ourselves in snow at 2365 meters height. 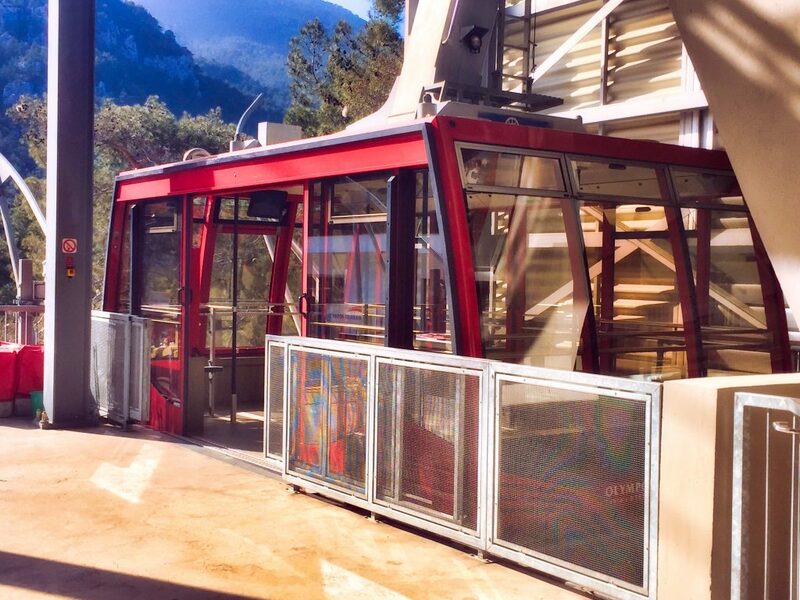 The views were stunning and the whole cable car structure was a feat of engineering. 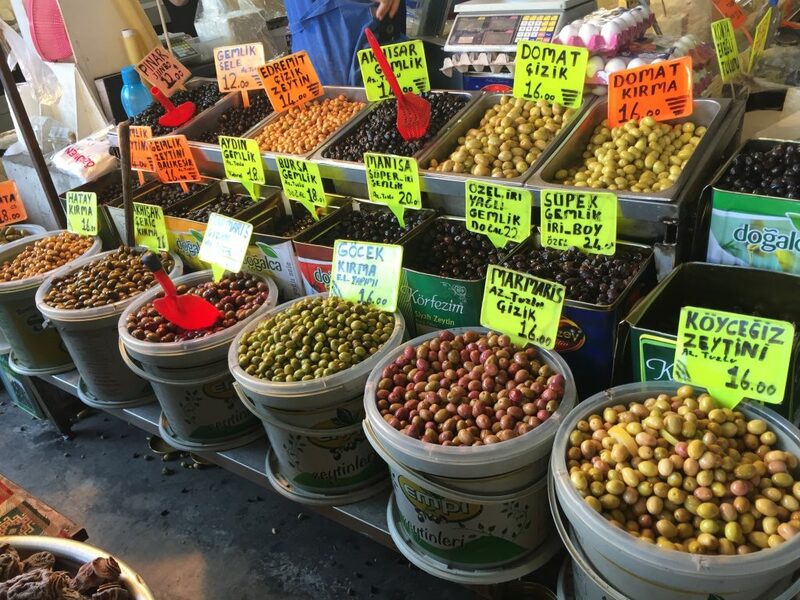 In late June, friends aboard an American cruising sailboat, Chuck and Patty on Soulmates came through Antalya on their cruise along Turkey’s southern coast. We shared some meals, and I spent one day showing them around a few of the local sites. 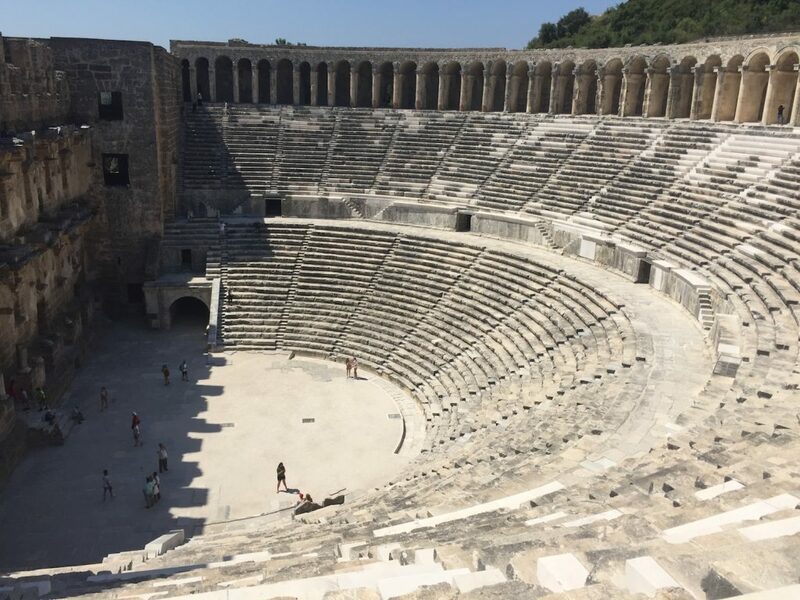 We visited the best-preserved Roman theater of the ancient world at Aspendos where they still hold performances since Ataturk had the theater restored in the 1930’s. 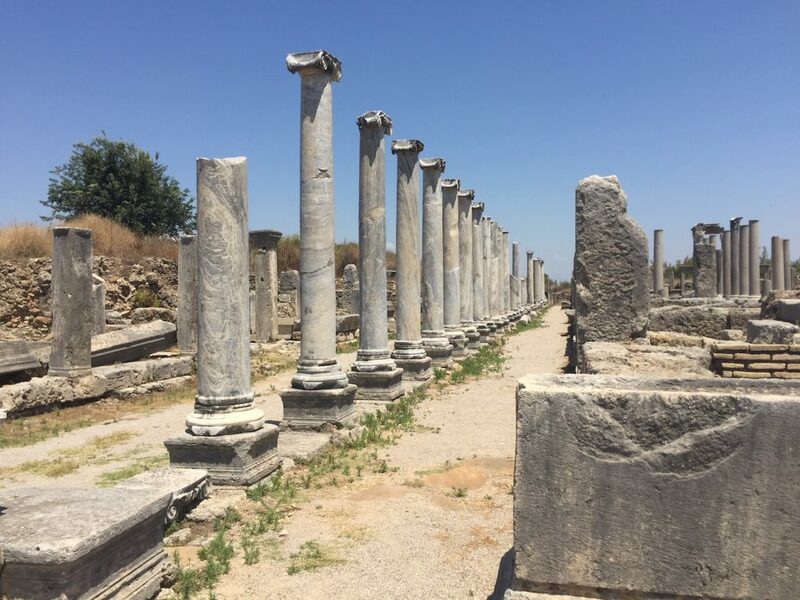 We also stopped to see the ruins of the huge Hellenistic city at Perge built in the 2nd century BC with its baths and market and stadium. The volume of archeological sites within a day’s drive of our apartment is stunning. And they are continuing to find more. People have been living in this area for thousands of years through dozens of different cultures and civilizations. 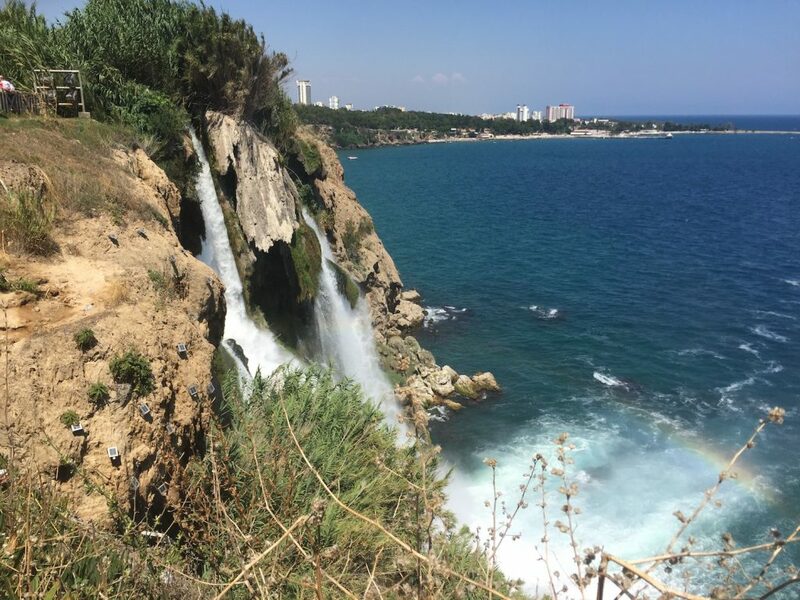 Finally, we stopped off at the Duden falls park right here in the city of Antalya where a waterfall drops into the sea. We ate a late lunch at a restaurant along the river and watched the guys taking rafts up the river so folks could do a mini raft trip down this stream. It’s a good thing they have a good net at the end. You wouldn’t want your raft to go over these falls! Recently, we also got the chance to go up on our local Antalya cable car with our friends, Baris and Dinçer Dinç, the brothers who are the owners and the brains behind Naval Yachts. Though the climb was not as high as Mount Olympos, the views of the city we have come to call home were stunning. From the marina, the port and the Free Zone in the foreground, to the miles-long Konyalti Beach along the shore, you can see why Antalya is a favorite for us as well as tourists. We ate gözleme and talked of travel, family and politics. And we had the opportunity to talk about what the impact of the drop in value of the Turkish lira is having on the average Turkish citizen. They explained that in the marine business, almost all prices now are quoted in US dollars (such as our contract). They also said that as employers, they try to help their workers with bonuses to make up for the loss of buying power. And while we haven’t really seen prices change much at the market, the supermarkets, or even at the gas pump, inflation is coming. Right now, Antalya is brimming with foreign tourists, and people here are not perhaps feeling the impact yet, but when the customers have gone and the city returns to the sleepy town we saw last winter, things are going to get tough for some of these folks. Yet, not once in all my time here in Antalya has anyone ever made me feel unwelcome when they found out I was American. They have reason to. I know Turkey has had economic difficulties for some time now, it’s not new. But there is no doubt that the severe drop in the lira one week ago was brought on by the war of words between the USA and Turkey. In spite of that, I have been treated with nothing but courtesy, kindness and respect. And I often don’t get that back in the USA! Is it any wonder we are loving life in Turkey? It was Christmas, 2014. 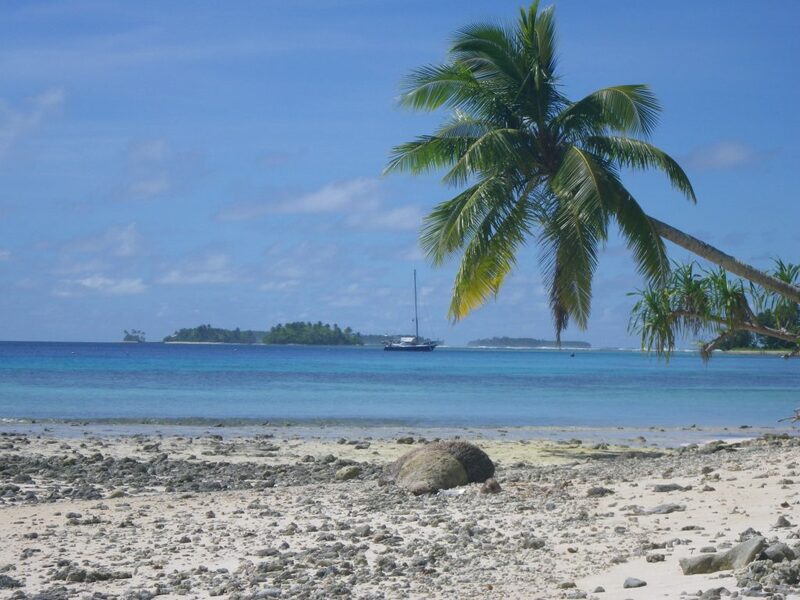 We were anchored in the lagoon of an atoll in the Marshall Islands, Majuro, off a gorgeous little motu called Eneko. That was to be only the second Christmas that Wayne and I had spent together. We had met just over a year earlier, when Wayne commented on my author blog, Sailingwriter. I was living aboard my sailboat, a Caliber 33, in Merritt Island, Florida after recently returning from the Bahamas. Wayne had been single handing his big steel motorsailer, LEARNATIVITY, out in the Pacific for about eight years, and he was currently in Fiji. We started up a conversation via email, which led to Skype calls and eventually to my flying out to Fiji for the passage up to the Marshalls. We’ve been together ever since. 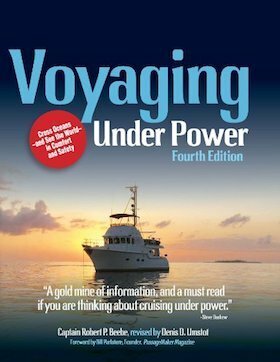 So, back to that Christmas when one of the gifts Wayne gave me was the ebook Voyaging Under Power by Robert P. Beebe and Denis Umstot. I can remember thinking, seriously? Powerboats? I started sailing as a kid and I learned the word “stinkpot” early on. I’d been a passagemaking sailor since my first job as a delivery cook from La Paz to Long Beach in 1974. Two years later, I sailed across the Pacific in an Islander 44 and spent the cyclone season in New Zealand with the man, James Kling, who would later become my first husband. That boat had only one piece of electronics—a home-built Heathkit depth sounder—and not even a VHF radio. I learned how to how to use a sextant, how to survive hand steering with a tiller on a 4-day passage when our wind vane broke. I learned to love our Aries wind vane that never let us down. We sailed back to California via Fiji, Samoa, the Line Islands and Hawaii, nearly all against the wind. 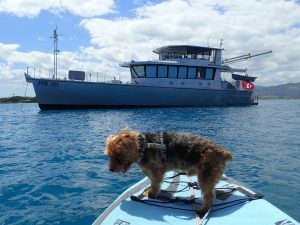 I’d worked on our bigger charter sailboat in the Caribbean, sailed on deliveries, and for the previous nine years, I had been sailing solo on my own little boat up and down the east coast of the US and out to the Bahamas. At that point, I’d been sailing for more than 40 years, and it was one of the reasons I fell in love with Wayne—he shared my love of sailing. So when he asked me to read a book about crossing oceans in a stinkpot, I was stunned. At that point, though, I was behind on a deadline to finish a novel that was due in May. I promised him I would read it as soon as I’d finished my book. As it turned out, I finished that book and shipped it off to my editor just a few days before we left on passage to sail down to Fiji for the start of the southern ocean cruising season. During my off watch time, I read Beebe’s book for the first time. Somewhere about the middle of the book, I became intrigued. No coincidence perhaps that the middle of book coincided roughly with the middle of that 1800 mile passage across the equator, i.e. the doldrums, and I was finding it a luxury to have 700 gallons of fuel. There were challenges to this idea of crossing oceans under power that I had never really considered, and many of Beebe’s points were valid. While the wind is free, what it takes to catch the wind is not. And sailors motor much more than they like to admit. In order to go faster in a displacement vessel, you need a greater waterline length. We were already sailing in a 54-foot motorsailer, and our maximum speed was only about 8 knots. If we wanted to go faster, what we needed was something long and lean and more efficient. Once you start looking at building a boat over 60 feet, the cost of putting a sailing rig on it is enormous. What if we put that money into fuel instead? I had lots to think about on that passage. On the very first day we met in person, Wayne introduced me to the new line of boats that Steve Dashew was building. We went for a walk around the boatyard in Vuda Point, and there in one of the cyclone pits was a boat called BUFFALO NICKEL, an FPB 64. As a long time sailor, of course I knew who Dashew was, but I had not followed this move of his to power. Even then, I’d thought it was a cool-looking boat. My first husband had built a 38-foot aluminum sailboat for a customer in Hawaii back in 1977, and we both had been long admirers of unpainted aluminum hulls. 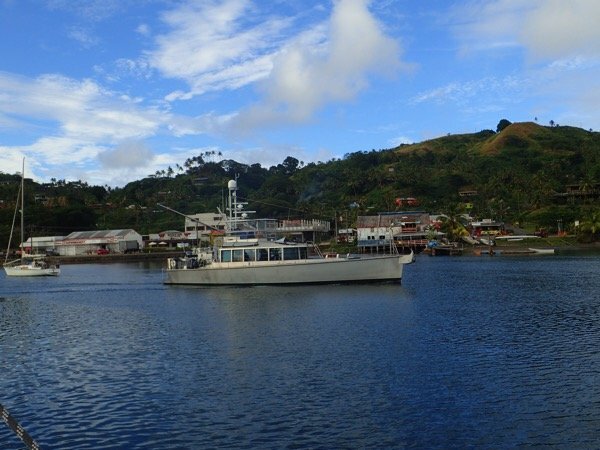 Serendipity had already played a big part in Wayne’s and my meeting, but when we arrived in Fiji to clear in, there in Savu Savu was another FPB 64, and this time I set out to meet the fellow and get a tour. The owner turned out to be a very nice guy from Washington state, Stedem Wood, owner of FPB64-8, ATLANTIS. He graciously gave us a tour and put up with our hundreds of questions for several hours. Hearing about his trip from New Zealand to Fiji that took him just over five days really got me to thinking. What would it be like to be able to do 9-10 knots regardless of the wind direction? Of course, serendipity was not done with me yet. We left Savu Savu and slowly cruised our way out to the Lau group. There, we met Marie and J.P. Dufour on the 20-meter Malcolm Tennant power catamaran DOMINO that had been featured in Beebe’s book. Again, we were invited aboard and given the grand tour. These folks had built this big cat themselves in Paraguay, and they had so many fascinating stories about that adventure. They were also strong advocates of power cats as ideal cruising passagemakers. They spoke of the ability to do 20 knots when needed, and we watched them retrieve the anchor a few days later and the way J.P. was able to spin that boat around with the twin screws was something to watch. At some point out there cruising through the Lau group of islands, Wayne tentatively brought up the subject. I took a deep breath and thought back to 1977. My first husband had asked me a similar question back then. We had cruised the Pacific on an Islander 44 that he had built from a hull and deck. 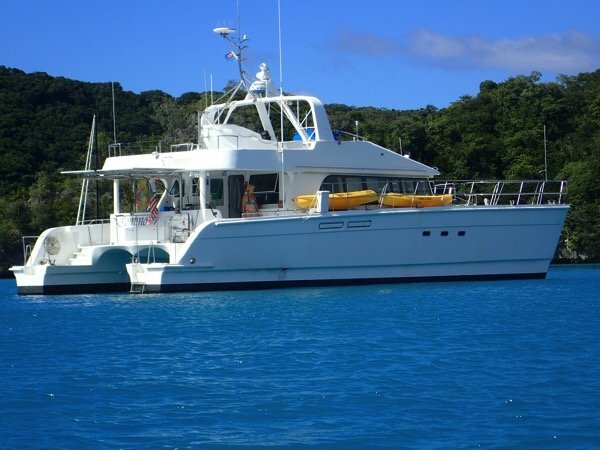 Jim was then proposing that we find a mold and have a 55-foot hull laid up to our specs, then build the rest ourselves. I was only 24 years old at the time. What did I know? I said yes. There began a grueling routine of working days in the boatyard, nights as a waitress, seven days a week. Those three years were the longest of my life. I came to say, partially in jest, that purgatory must be a boatyard. You never get out. When we did finally launch that boat that became our home for the next 14 years, I said silently under my breath, Never Again. And yet, there I was smiling at my new husband, nodding and saying yes. We had lots of time to talk and dream as we cruised Fiji, but the more we read and talked, the more convinced we both were that this was something we wanted to do—and could do. Eventually, we made our way back to Vuda Point where we hauled LEARNATIVITY out and started on what would become a full year’s refit. While we were there in Vuda, Stedem arrived on ATLANTIS, and I enjoyed catching up with him. 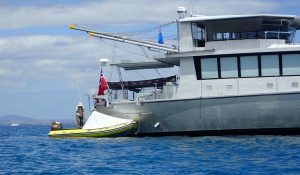 While we had covered about 300 miles sailing around Fiji during the cruising season, ATLANTIS had been up to Palau and back covering well over 3,000 miles. And he certainly didn’t look exhausted. Then, while all the sailboats were sitting in Vuda Marina waiting for a good weather window to head down to New Zealand, ATLANTIS took off. He didn’t need favorable winds, and he would be able to get down there between the infamous low pressure systems that stalk boats on that passage. That was it for me. I was sold. We decided to move over to the dark side.